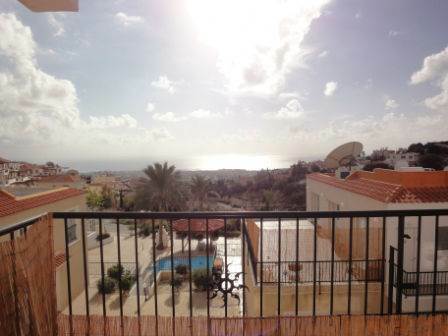 Peyia, Paphos - This spacious 2 bedroom apartment is nestled on a mountain side, only two minutes away from the centre of Peyia village, with its beautiful fountains in the picturesque stone-paved village square, and its good selection of shops, tavernas, banks and restaurants. Coral Bay with its golden sandy beach is only a 5 minute drive away. The apartment comprises a well equipped kitchen nicely separated from the spacious lounge and dining area by attractive archways. From the lounge, patio doors open onto a long balcony with the most fantastic sea views. A wide doorway off the living area leads to a guest toilet, and two double sized bedrooms with fitted wardrobes and en-suite shower rooms. The master bedroom has patio doors opening onto the same balcony with stunning panoramic sea views. The swimming pool is well maintained and there is plenty of space for relaxing in the sun. On the one side is a pergola and outdoor barbacue for social gatherings. An allocated covered parking space is provided.